Manufacturing/Warehouse with office space. 3 buildings. 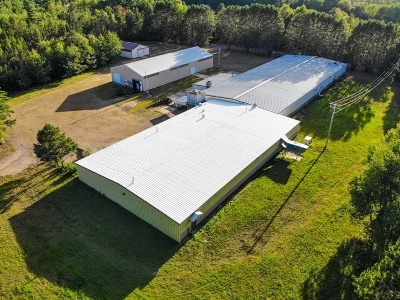 1 main building 28, 130 sq ft with multiple garage doors, loading dock multiple men and womens bathrooms, eye wash stations, sawdust burners, natural gas heat, 25ft between collum, 6 inch concrete floor, 13&apos;6 to beams to floor, 11 ft to some pipes, 10 ft doors, 480 Volt 3-Phase power, 208/240 Volt 3 Phase Power, compressor lines. 3 offices, reception area, large brake room, AC on roof. 1 pole building 7, 056 sq ft with 14 ft ceiling clearance, 120 spots for pallet racks, concrete floor, loading dock and three service doors, power and wired cold storage. Second pole shed is 2, 016 sq ft with 10 ft door, concrete floor, cold storage, wired with electrical, two service doors. 8.30 Acres of land with more available.